In a recent post, we pointed out the important role that emerging markets will play in driving global demand over the next decade. The ASEAN states, with their combined population of 600 million and briskly growing economies, are a key emerging-market bloc. Needless to say, there are a number of promising study abroad markets within this group – Vietnam and Thailand included – but the most populous ASEAN state, Indonesia, appears poised to garner more attention from international recruiters in the future. The number of families with household incomes exceeding US$10,000 is predicted to double by 2020. Average disposable incomes are expected to increase at 3-5% per year. Many observers and analysts have projected the Indonesian economy will move into the world’s top 15 economies in the next decade. A 2012 report by McKinsey & Company notes that the Indonesian economy is the 16th largest in the world, showing strong performance over the past decade or more, and is more stable and diverse than many external observers realise. The same McKinsey report goes as far to suggest that, by 2030, the country could be the world’s 7th-largest economy, overtaking the United Kingdom and Germany. This reflects both the projected year-over-year growth in the Indonesian economy for the next decade and more, as well as some of the country’s remarkable underlying strengths: its large population, demographics, resource base, and growing household incomes. 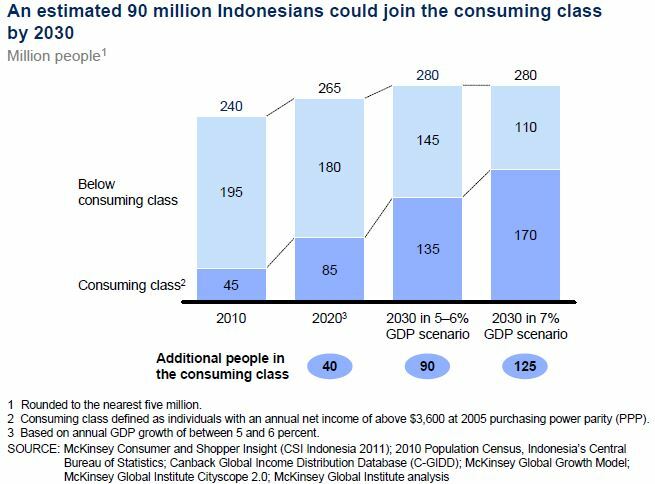 McKinsey notes that by 2030, “Indonesia will be home to an estimated 90 million additional consumers with considerable spending power” – that is, members of a “consuming class” with annual net incomes of US$3,600 or more. A March 2013 report from the Boston Consulting Group echoes these projections for a dramatic change in household income over the next decade, stating that the number of MACs [middle class and affluent consumers] in Indonesia is expected to double from 2012 to 2020, from 74 million to 141 million. When this occurs, the island of Java will have more MACs than the whole population of Thailand, according to the report. This projected growth in spending power is also strongly linked to a value system that prioritises investments for the family. Naturally, the country faces major challenges as well in sustaining its current high levels of economic growth. Some analysts point to the need for significant productivity gains in the years ahead, as well as increased investment in infrastructure and services and the challenge of regional disparities in growth and economic opportunity across Indonesia’s vast archipelago. The Jakarta Post recently reported on growing skills gaps as Indonesia’s higher education system struggles to keep pace with the country’s rapid economic growth. Many companies risk being left behind by being forced to reduce their expansion plans unless they can recruit, retain and develop competent human resources. It is predicted that talent shortages concerning managerial positions in Indonesia will worsen. At EAIE 2013, Professor Bateson pointed to a dramatic increase in higher education participation, noting that the percentage of college‐aged students enrolled in higher education had increased by 50% since 2006. That amounts to nearly three million additional seats having been filled at Indonesian colleges and universities over that period. The British Council has similarly observed that Indonesian higher education participation grew by 53% from 2000 to 2009, and that total HE enrolment is projected to jump again to reach 7.8 million by 2020. Sumatra and the smaller islands surrounding are the centre for the production and processing of Indonesia’s natural resources and energy reserves. Java, with the nation’s capital in it, will be the driver for national industry and service provision. Kalimantan (also known as Borneo), is regarded as the centre for the production and processing of energy reserves and national mining. The island of Sulawesi and the smaller groups of islands around it (to the eastern part of Indonesia) will serve as the centre for agriculture, plantation, fisheries, mining as well as oil and gas drilling and processing. The well-known island Bali, along with its neighboring Nusa Tenggara to the east, are designated as the country’s gateway for tourism and national food support. The Moluccas Islands and Papua, on the eastern tip of the archipelago, will serve as the centre for the development of food, fisheries, energy, and national mining. What then does all that suggest in terms of Indonesian demand for study abroad? Roughly 1% of the country’s current higher education enrolment base is internationally mobile. This amounted to about 43,000 students in 2011 according to OECD statistics, making Indonesia the third-largest source country in Southeast Asia after Vietnam and Malaysia. Working off an earlier estimate of the total number of students studying abroad, The Jakarta Post reports the top five destinations for Indonesian students are Australia, the US, Malaysia, Germany, and Japan. Indonesia is a top-10 source country for Australia but plays a relatively minor role in most other destination countries. And, as we have reported previously, Indonesian students are likely to be increasingly targeted by regional education providers in the years ahead. The Indonesian population skews young and current demand is heavily weighted to undergraduate programmes, particularly in business and STEM fields, and for related language studies. As the country’s middle class dramatically expands over the next decade, and as policy makers and families alike invest to keep pace with the demands of this rapid economic expansion, we can expect not only increasing higher education participation in Indonesia but greater demand for study abroad as well. Indonesians will expect, and will be able to invest in, greater access to higher education. This is particularly the case when it comes to access to the high-quality programmes that can help prepare Indonesian students for the demands of a rapidly changing economy and society, and that can help address the looming labour market gaps that will otherwise challenge the country’s dizzying growth forecasts through 2020 and beyond. This entry was posted in Asia, Higher Education, Indonesia, Most Popular, Regions, Vocational and tagged universities with international students, higher education statistics, STEM degree, postgraduate student recruitment, tertiary education overseas.